Ana Blandiana, My Native Land A4 (Bloodaxe, 2014 ). Trans. Paul Scott Derrick and Viorica Patea. Coming to this collection as an outsider, to both the native language of the poems and the native culture, may at first appear a fool’s errand. Commentary on poems which will be so completely grounded in the timeline of Romania and it’s often tumultuous recent past, from a Western poet with a cultural normativity that has been untouched in generations may seem incongruous, but there is something that this collection explores which in fact make this commentary more receptive than may at first have been expected. Paul Scott Derrick and Viorica Patea’s translation of Ana Blandiana’s beautiful and entrancing collection consists of deftly composed vignettes full of emotive moments, captured and released. What can be felt most keenly from this collection, from one of the most engaging yet ethereal poets of the 21st Century, is the notion of space. These silences that Blandiana explores are not external to her, they are part of her, they are her history, her present, her future. A deep and resonant feeling for the silences in her world is shown in every poem. The words echo with tremors of shifting theological attitudes. They shake with the crush and intolerance of a totalitarianism that was not merely viewed from afar but that was endured, rebelled against, and satirised. The title of the collection, My Native Land A4, shows something of her overall aim: Can you fit a country, an origin, on a sheet of A4 paper? This is the question to which Blandiana is attempting to find a solution. And I think her answer is yes. It cannot be done completely at one time or by one person. But if we all filled our A4 pages with our countries, the atlas we built would show so much more links than divisions, would create so much connection, could link the most antipodean people. This atlas would show that even though we grow in different soil, there is so much that can be shared simply with words. Where the gods live when they stop being gods […]. 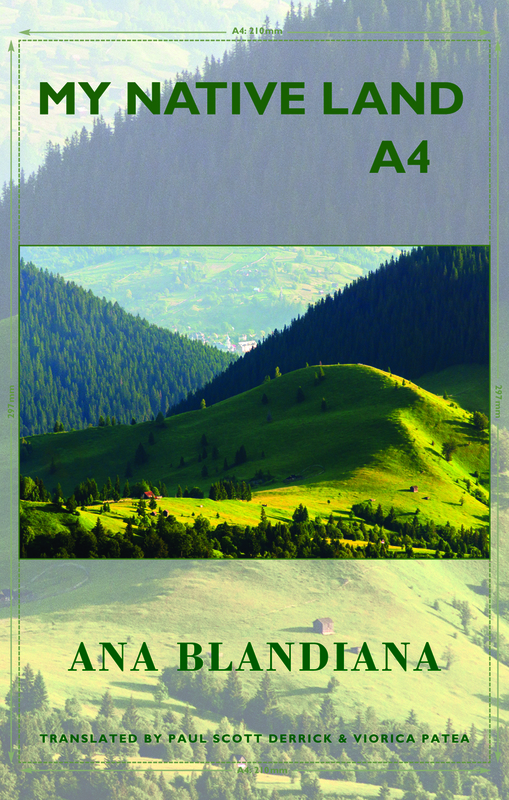 Blandiana writes with passion, satire, humour yet never loses sight of the fire within herself, and her country. Rubs against the stumps of feathers […]. This poem, which begins with a series of invocations to the God of creatures, insects, night, turns swiftly to short, aggressive lines, laden with plosives and choppy words. This narrator carries less sympathy than others in the collection, and may be closest to the poet’s own opinion. Most of the poems in this collection are short, nearly Imagist, captured moments. They illuminate a small space in the world for a small time, and they draw the simplest, yet most detailed picture of that time. While the actual moment of death is noted in the poem as a small time/date reference, the ripples from that moment feature large in the rest of the poem. Blandiana takes the bold step of denoting that the act of dying is not the primary element of death, of crossing that boundary. The primary element is the way in which life is changed, and whether we choose to remember the lost. Michael Lee, in his poem ‘Pass On’, notes “when we die, we go everywhere / there is always a breath of wind somewhere” – there is much of this feeling in Blandiana’s eulogy to her departed mother. This collection strips back to the heart and muscle the poet’s understanding of her country, raising a fist towards the boundaries between physical and metaphysical, while exploring an the silence and space between people and between moments in life. There is a melancholy to much of the poems, but there is still hope and patience in the collection. We all live in a world where boundaries and divisions have become so commonplace, we barely notice how many we clamber over on any given day. Yet, Blandiana can still demonstrate the poignancy of boundaries, the ineffectuality of enforced division, can still speak to the heart of what is sad about separation without the bombast and rhetoric too often used in this area. There is something incredibly calming about spaces in the world, and there is something concrete about how Blandiana explores the spaces she knows. Her eloquence evokes a clear understanding of her world, and this eloquence connects all those who read these poems, no matter their origins.